India just broke ground on a gorgeous solar-powered sports complex that will harvest piezoelectric energy from the crowds that enter its gates. 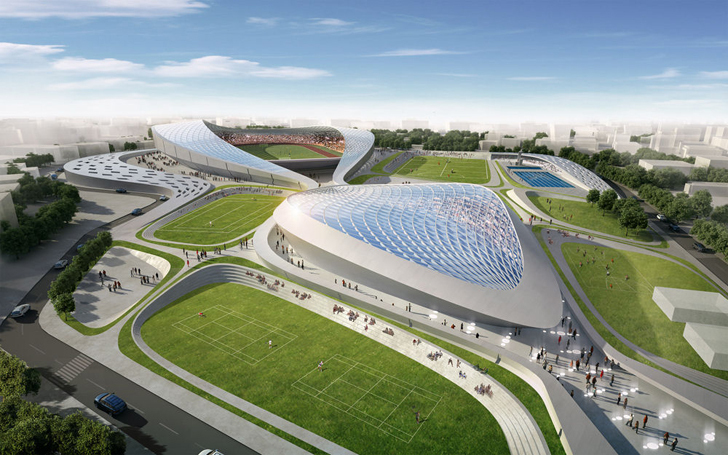 Designed by Studio Symbiosis, the Athletic Ripple Project was recently commemorated by India's National Congress President, Sonia Gandhi. The vast new complex emerges out of the natural landscape as an iconic structure that mimics the form of water droplets. Each section, or ripple, contains a different sporting activity space. The “droplets” vary in size, design and purpose, but Studio Symbiosis unified each section by designing them to symbolize individual pebbles in a pond. The complex to emulates the ebb and flow of a swelling pond, and therefore gradates into the existing landscape rather than obstructing it. The complex is a sort of “sports city” that was designed to minimize congestion — a pedestrian walkway will be constructed down the middle, and opposing roadways surround the perimeter. The walkway brings visitors closer to the action and away from the surrounding urban environment and traffic. The sports center also boasts an impressive roster of sustainable and energy-efficient building strategies. The roofs of the various stadium cells are lined with both solar and pneumatic panels, which collect and generate energy. The center’s anticipated heavy foot traffic will also be put to good use — piezoelectric generators will harness the movement of the crowds and convert it into energy. The ambitious project will continue to develop and it’s currently slated for completion in 2012. Alguém saberia me informar algo sobre a estrutura deste projeto e quais o materiais construtivos?? Actually, cars would stress piezo crystals too much. Foot traffic is much better suited. vehicle volume is expected to rise greatly in the future. The Indian road network the third largest road network in the world. The complex to emulates the ebb and flow of a swelling pond and therefore gradates into the existing landscape rather than obstructing it. 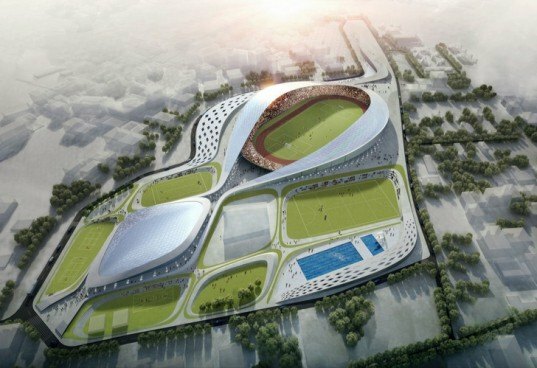 Read more Solar Powered Piezoelectric Sports Stadium Breaks Ground in India | Inhabitat Green Design Will Save the World. While public transport still remains the primary mode of transport for most of the population, and India's public transport systems are among the most heavily utilised in the world; only around 10% of Indian households own a motorcycle. At the same time, the Automobile industry in India is rapidly growing with an annual production of over 2.6 million vehicles. And vehicle volume is expected to rise greatly in the future. The Indian road network the third largest road network in the world. At 0.66 km of highway per square kilometre of land the density of India’s highway network is higher than that of the United States (0.65) and far higher than that of China's (0.16) or Brazil's (0.20). I like what lazy reader has to say! would certainly cut down on the outrageous levels of hyperbole if you stripped those words out of articles. IMHO piezoelectric generation is fairly irrelevant technology, far better in a sunny country in India to invest heavily in Solar. Also would like to point out that a parking lot is a very american view point, somewhere like this is unlikely to have a large one as India rely's much more heavily on mass transit systems. Here's a challenge. Inhabitat should write an article............under one condition. They can not use any of the following words.......... Green (unless referring to color), efficient, eco-, sustainable, renewable, solar and wind. The Piezoelectric effect creates a charge of electricity between the differential of two metal plates when struck. Energy could be generated by a sidewalk embedded with these materials. Wouldn't a place like this have a large parking lot. Would the energy generated by sun and human traffic be negligible to the amount of energy used simply to bring people hear to begin with. It would be like bring only candles to a light bulb factory. Each section, or ripple, contains a different sporting activity space. The “droplets” vary in size, design and purpose, but Studio Symbiosis unified each section by designing them to symbolize individual pebbles in a pond. The complex to emulates the ebb and flow of a swelling pond, and therefore gradates into the existing landscape rather than obstructing it. The complex is a sort of “sports city” that was designed to minimize congestion -- a pedestrian walkway will be constructed down the middle, and opposing roadways surround the perimeter. The walkway brings visitors closer to the action and away from the surrounding urban environment and traffic.